Today I traveled to Omaha, Nebraska, by the way of The Omaha Daily Bee dated October 21, 1913. There I found a very interesting British lady had been detained at Ellis Island for the past three days, that being militant suffragist leader Emmeline Pankhurst. She had come to the States to do lecture engagements. “…It was difficult to imagine that the slightly built, gray haired little woman who stepped ashore from the ferry boat at the Battery was the same person that for several years had caused the British government so much trouble by reason of her militant tactics in behalf of woman suffrage or her incitation to militancy for the ’cause,'”. It took President Wilson and the Secretary Wilson of the Department of Labor issuing an order of release to allow her admittance into the country. Did you ever think that you were irreplaceable on your job? A maid, Rose Bergenhammer, found this to be true. 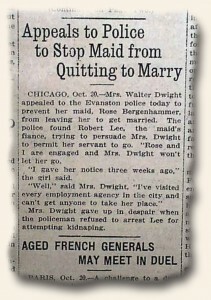 She was engaged to be wed and gave her employer, Mrs. Dwight, three weeks notice. Mrs. Dwight went to every employment agency and could not find anyone to take her place. When Rose tried to leave, Mrs. Dwight called the police and tried to have her fiance, Mr. Lee, arrested on attempted kidnapping charges. Rose must have been a fantastic maid! Hello Oteria: We do not monitor requests concerning the value of newspapers through this venue – but we would be glad to assist. If you have a newspaper or a collection for which you are seeking an appraisal, please contact us directly at info@rarenewspapers.com. Please include as many details as possible. Thanks. Whats the value of a daily news newspaper of 1963 of jfk’s assassination worth in mint condition? Hello Shamell: We do not monitor requests concerning the value of newspapers through this venue – but we would be glad to assist. If you have a newspaper or a collection for which you are seeking an appraisal, please contact us directly at info@rarenewspapers.com. Please include as many details as possible. Thanks.